Iain Henderson is earmarked for big things with Ireland and Ulster. So what do you need to know about the giant lock? Those who know him best reveal all. 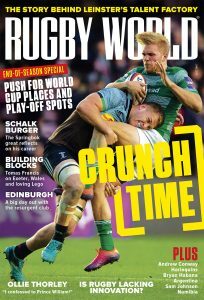 This first appeared in the April issue of Rugby World magazine. THE SIGHT of Iain Henderson hitting opponents like a dance floor is now commonplace for any fan who watches Ulster and Ireland. However, there is more to the versatile back-five forward than pancaking defenders on the way to inflicting yet more trauma on his rivals. Talk to anyone about Henderson and before too long, words like “freak” or “monster” come up. No qualification is needed – lurking menace is implied. But something else spoken about, almost as often as his raw power, is how quiet the former Queen’s University maths student has been since he first showed up at his local pro team. Tony McWhirter was Ulster’s No 8 when they beat Colomiers 21-6 in the 1999 Heineken Cup final. These days you can hear the dental surgeon talk all things Ulster on BBC Northern Ireland. Henderson’s current team-mate Luke Marshall takes things a step further in chiselling down to the core of his giant pal. “Simple is probably a good way to describe him! He’s not your typical superstar – because that’s the sort of status he’s at, at the minute. “What’s quite funny about Hendy is that, outside of playing rugby, he doesn’t really have a massive interest. He doesn’t really watch other games. There have been big games in the past and we’ll be talking about the team and he won’t even know some of the players! These are maybe household names and he’s just so relaxed. In November, Henderson found himself gaining a lot of attention after knocking South Africa’s guard dog, Eben Etzebeth, to the dirt with a big carry. How had that lifted Irish team-mates, we wondered. “He’s turned into the enforcer he always had the potential to become,” Devin Toner said of his fellow lock at that time. “When he was coming through we didn’t call him ‘man-child’ for nothing. He’s a monster in the gym and a monster on the pitch. It’s great to see him turning into the player he can be. Henderson told the Press Association on the eve of this Six Nations that the hype was something out of nothing, though. “That was a two-second period in an 80-minute game,” he said of his blitzing carry towards Etzebeth. “People may look at that and say I’d played brilliantly because I ran over the top of him, but if I do everything else wrong in the game then I’ve played badly. And if Eben happens to miss that tackle but is excellent everywhere else, then he’s still played really well. So that’s probably where you have to take things with a pinch of salt. It’s not about a highlights-reel kind of approach. “It’s the guys that make the game so much easier for their team-mates that I look at, respect and want to emulate. For years at Ulster and with Ireland too, that’s been Chris Henry. If Jacob Stockdale makes a great break, it probably has something to do with a really good ruck clean at the breakdown before, from one of the forwards. Everyone interviewed here talks about Henderson’s performances as a British & Irish Lion, in New Zealand last June and July. McWhirter feels he was unlucky to miss the bench for the deciding Test after his final midweek display against the Chiefs. The rest were just impressed. He was not an instant Test sensation. Henderson has had to climb over a few competitors to get to where he is now and to realise his physical potential. Ex-Ireland tighthead Mike Ross knows all too well about Henderson’s progression. “One of the nicknames when he first started with Ireland was ‘The Llama’ because he would just wander around the place,” Ross remembers. “At that time, in his first camp, he’d miss lineouts and stuff. If you watched him in the U20 World Cup along with Tadhg Furlong, it took time for that player to grow into a force. McWhirter sees Henderson as a natural successor to Rory Best as Ulster skipper. Marshall can see him leading more too, and McComb has enjoyed seeing him animated in post-match huddles. Ross knows Henderson can lose shape in the scrum, but he has the power to make a difference anyway and the prop expects him to improve technically. McCarthy just wants him to call lineouts. Looking at the bigger picture, former Ireland and Lions lock Donal Lenihan has the last say on Henderson’s future. “Henderson is an outstanding talent who just needs to increase his work-rate and add more consistency to his game,” he says. “We were offered a true glimpse of what he is capable of in the last midweek game of the 2017 Lions tour, against the Chiefs in Hamilton.